UPDATE (July 30, 2015) : See also : Jamie Williams remanded in custody after attempting to travel to Iraq to fight with Kurdish forces against Islamic State, Dan Oakes and James Oaten, ABC, July 28, 2015 | Suruç Massacre: Solidarity from Melbourne, Insurrection News, July 27, 2015 | Families of Australians fighting against Islamic State in Syria want loved ones to be granted amnesty, Donna Field, ABC, July 27, 2015. 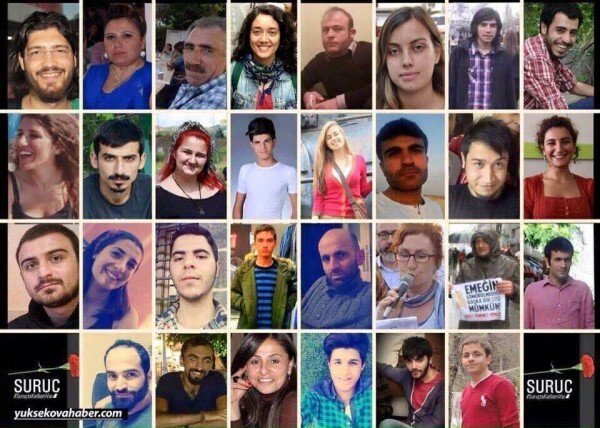 See also : Turkish activists killed in likely IS attack, Deutsche Welle, July 20, 2015 | Turkish airstrikes ‘very damaging’ to Kurdish peace process, Martin Kuebler, Deutsche Welle, July 27, 2015. 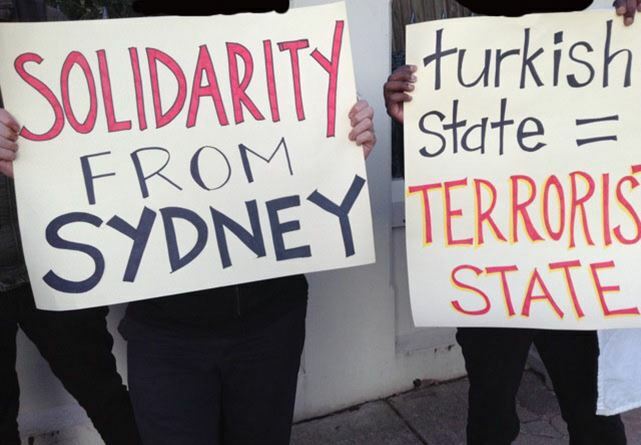 With sadness and anger, people demonstrated at Turkish consulates in Sydney and Melbourne Australia yesterday 5pm to condemn the Turkish state’s complicity in the Suruc massacre and commemorate those fallen in the attack. We stand with those fighting both the overt and covert state sponsored terrorism of the Turkish state, with Kurdish liberation fighters, and with all who are brave enough to resist in the face of such repression. 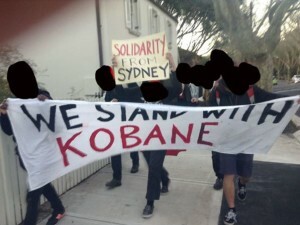 Let it be known, as our banner read ‘We stand with Kobane’ and are inspired and strengthened here by the resistance over there, thank you. In Sydney attempts by local police to intimidate us on social media, demanding forms be filled out to determine our protest ‘legitimate’ were ignored, supposedly justifying the heavy policing on the day. We do not recognise the authority of the white colonial state known as Australia. Standing with the Aboriginal flag, we remind ourselves of the historical and ongoing state violence against First Nations people here. With its bloody and racist policies, we are disgusted by the hypocrisy of the so-called Australian state attempting to tell us what is ‘legitimate’ or not. Decolonise now- full sovereignty for Aboriginal communities! Kurdish liberation now! This entry was posted in Anarchism, Death, State / Politics, That's Capitalism!, War on Terror and tagged Kobanê, Kurdistan, Melbourne, Suruc, Sydney. Bookmark the permalink.